Save Your Boot! Save Your Loot! Get your V-Twin Skin today. 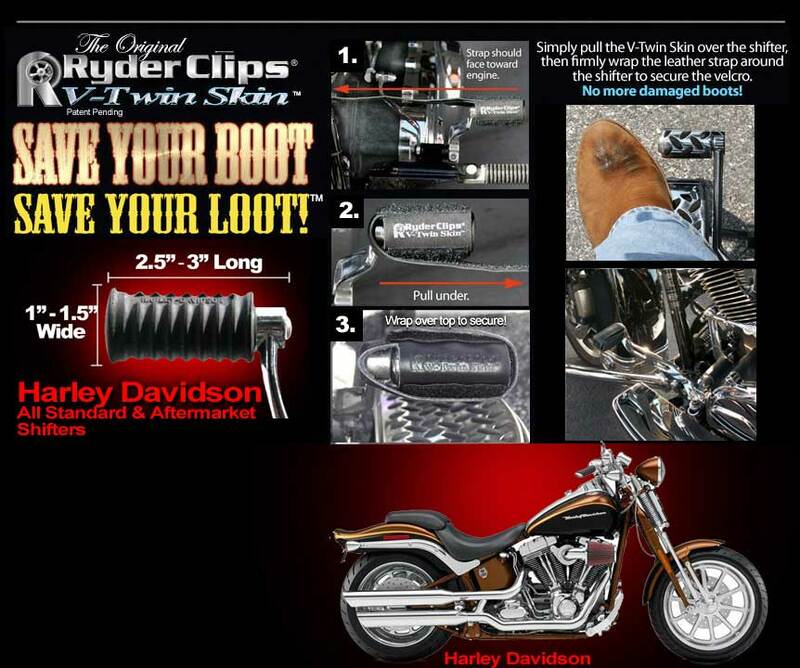 Only The Original V-Twin-Skin will save your Boots! Made of genuine quality leather the V-Twin-Skin simply slips over your shifter. After an easy installment it is going to look fantastic! No more boots damaged and ruined get a V-Twin-Skin today! It is a classy touch to your bike and saves you big money by protecting your boots clea, keeping them looking good! The V-Twin-Skin Fits all standard and most aftermarket HARLEY DAVIDSON shifters. Fits all shifters from: 1″- 1.5″ Wide to 2.5″- 3″ Long. The V-Twin Skin motorcycle accessory protect your boots on the motorcycle shifter. To install the skin simply wrap the accessory around the shifter on the motorcycle and your boots will be protected.